Video not working? Watch it on the TEDx website here. Unfortunately I was a little rushed with preparation for practical reasons, and ended up focusing more on trying to remember content and less on the delivery itself, so the talk is a little drier than I might have liked but you'll get the gist. Alternatively, if you haven't the time to watch it here's the full transcript, which also contains some of the anecdotes I missed. Let's start by considering seemingly impossible challenges. Globally more than a 100 million women are estimated to be missing - which is a soft way of referring to the gender bias in mortality due to abortion, female infanticide or insufficient care given to girls. India by itself accounts for nearly 50 million of these. That’s not even talking about the frightening numbers that have been trafficked or married off before they have even had time to finish childhood. I could go on, but instead let’s pause for minute and do a quick two step exercise. Step 1 - Take a moment to think of one big issue that really pains you. Something widespread or pervasive. Step 2 - Consider whether you genuinely believe that you personally could do something to fundamentally impact or eradicate that issue within your own lifetime? More often than not, the answer to the second question is a less than confident 'maybe', or an outright 'no'. In essence this reflects the difference between what you know could potentially be achievable, but on a practical level for you feels pretty much impossible. What if I told you however, that it actually might be more doable than you think? See, the interesting thing about the human brain is that if it doesn't understand something, it thinks it's impossible. People are typically able to work really hard on things within their comfort zone, but they often get paralysed when they have to work hard at things they don't understand. They simply don't know where to start and so they either give up, procrastinate or default to whatever it is they feel able to cope with. Take a Rubik’s cube for example. We all know they are possible to solve, but for most of us it only takes a couple of attempts to conclude that there’s probably some kind of magic involved that’s completely beyond us. But the fact is there are people out there who can solve them in under 10 seconds. Some can even do this one handed. The thing is they understand what they are doing. It is not complicated for them. And just like the Rubik’s cube, solving our biggest social challenges can actually be straightforward for all of you too, once you understand what you’re doing, and if you are willing to put in the time in to get that understanding. If it's so simple why don't we do this as a matter of course? The trouble is that understanding the problem takes a lot of leg work and time, and we live in a world of ideas and instant gratification. We are looking for magical fixes and quick solutions. The urgency of the problems we see drives us to rush in and get started. The result is that many solutions and approaches are built almost entirely on assumption. For the most part we get close enough to make a difference, but it isn't enough to fundamentally dismantle the really big challenges. To investigate the issue involves primary and secondary research as well as understanding existing theory and best practice. Immersing yourself in it however involves making it part of your life experience. Being at the coalface, getting on the ground and observing or helping deal with the issue over a significant period of time. A great example of what it takes to really understand the dynamics of a social situation can be found in a book called The Corner by David Simon and Ed Burns. If you’ve ever watched The Wire you’ll know the one I mean. It chronicles the life of poverty on the drug riddled corners of West Baltimore in the United States, and took years to write. The authors rarely offer their own opinion, but in the few pages that they do, it is enlightening. You're left in no doubt that they have fully understood both the ecosystem and root causes of the outcomes they document. If they chose to address these issues, no doubt they would develop powerful solutions that actually might work, as compared to those of us who pile in with lightly considered interventions. The point is that they didn't do anything special, complicated or impossible. All they did was invest the time both to investigate and immerse themselves in a social situation that moved them. The key here is the amount of time. By the time The Corner was published, David Simon had been immersed in that reality for 13 years. If you're serious about tackling a systemic issue, the first building block of success is whether or not you're in it for the long run. A solution that works – i.e. An approach, methodology or solution that works, and by works I mean is capable at least in theory of achieving your vision at an individual or local scale. An infrastructure that can deliver it effectively (and for long enough to prove transformational impact) – i.e. An organisation, network or coalition that can deliver it effectively, and by this I mean an organisation that is capable of consistently delivering this impact. A way to reach everyone who needs it - Once you’ve got the solution and infrastructure in place you need a practical way to reach everyone that needs it. In other words you need to a practical way to meet the real scale of the problem you are trying to address. Success or failure in all three is decided by the same building block, which is your understanding of the problem itself. To help you understand what I mean lets use an example of a great organisation I worked with in Chile. Most people don’t genuinely believe that we can address real poverty, but Rodelillo is doing it, and doing it well. They have a solution that works: It was developed through deep understanding of the problem, based on the founder Maca Currin’s personal life experience, and targeted at a vision of completely transitioning families out poverty. And by this I don’t mean increasing income by some small percentage, but real outcomes that achieve stable employment, home ownership, and the ability to send children to university. They have an organisation that can deliver it effectively: Over 25 years, 30 full time staff and an army of volunteers have directly impacted 35,000 families and thus proved that the solution is capable of achieving this vision with a success rate of more than 90% of families transferring out of poverty. They are now working on ways to reach all the people who need it and they are doing it through government adoption. The Ministry of Development and Planning (MIDEPLAN) recently designed a program modelled on Rodelillo's approach. Called the Bridge Program, it will serve 250,000 families over the next three years. As the Rodelillo example demonstrates even the hardest challenges are in fact doable, so why is it that we don’t regularly come up with similarly powerful solutions? The answer is that we start with ideas instead of starting by understanding the problem, and the ideas we have are commonly driven by solutions we are already familiar with. So effectively we start with solutions and then try and fit them to whatever we know about have of the issue we are concerned about. I call these “solution based solutions”. We see children playing on the street in a village near us and figure they'd be better off in school. We build a school, grab the state curriculum, find some teachers and away we go. Our friends think we’re amazing, and funders give us money because everybody 'knows' that education is a good thing. However if we had stopped to immerse ourselves in their life we might have realised that what they really needed to learn is not covered in the average state curriculum and isn’t transferable through classroom based learning. They need to know how to use their land, and the assets available to them. However, instead of teaching them about irrigation we teach them about rainfall in Russia. Had we investigated further, we might have realised that they needed a range of other forms of developmental support that extend beyond technical education. If we followed them past school, we’d probably see them migrate to unfamiliar urban environments needing life skills that our school didn’t prepare them for. We might even look for solutions to stem that migration, instead of realising that we were the ones causing it with an educational solution that disconnected them from their home environment. Effectively then, when it comes to tackling big issues people usually start with the solution, strategies, vision, or mission, instead of where they should start, which is by understanding the problem. The reason is that most of us are excited by the creativity and challenge behind these ideas and solutions, and not the grunt work and time required to immerse ourselves in issues. In reality without a sensible problem definition you can’t establish a meaningful vision, because your vision should be a detailed picture of what the problem looks like when it’s fixed. Instead you end up with solution oriented one-liners - things like "One day all children will get an education that matters." What does 'matters' even mean? And education isn't a vision anyway. It's just a strategy. If your vision was a world where children are free from persecution, that would at least make more sense as a vision. But then you'd have to clarify what you mean by persecution. Is it child labour, sexual abuse, bullying, harassment, domestic violence? Where do you draw the lines between harmless teasing for example and harassment or bullying? Either way you can see where I'm going. You need detail and clarification. And you can only get that detail if you understand the problem you are trying to fix. So to reiterate, without a good understanding of the problem you can't establish a clear vision, and the trouble is that without a detailed vision you can't establish meaningful targets. The reality is that everything related to delivering impact is interlinked, and all of it sits upon a foundation of good problem definition. What you need then is true "problem based solutions". Here's a framework I use to show it all fits together. Think of it as a full stack meta-model for solution design. I’m not going to explore it here, but I’ve put up a video online that talks you through it. You can find it here with a full transcript or just the video on Youtube if you’re interested to know more. You can see not only how solution design starts from understanding the problem, but also how organisational structure and roadmaps for the future are tied to it too. The other interesting outcome of understanding the problem is that it actually simplifies the solutions we need. There may be lots of surface characteristics and apparent nuances, but once you can see how they fit together, you often find there’s only a small number of root causes. At Make A Difference after 8 years we've learnt this the hard way. We are familiar with the experience of children in shelters, but we don't really know what happens to them after they've grown up. Nobody out there seems to be tracking this. Without that baseline we will have no idea if our interventions are actually making a difference in the long run. We've therefore embarked on a journey to really understand the problem we are dealing with, and are changing our solutions to make them capable of adapting as we learn. Trying to find out what has happened to adults who grew up in shelters isn't easy. There's no database to use, no telephone lists or email addresses. Our research teams are doing the leg work to find people and are then immersing in their reality by investing the time to build relationships with them. As we do this, we're finding that what initially seemed like an impossible task of overwhelming complexity, is actually full of manageable patterns that we can wrap our heads around. There's only so many routes of entry into shelters. Only so many types of shelters, and only so many outcomes we need to worry about. For any given aspect, there are already focused interventions that have been developed by others. We don't even need to reinvent the wheel. We just need to tie them together. Enable the institutions that impact them. Within these we have a number of key intervention points. For empowering children we need to consider emotional health, life skills, education, work readiness and after-care. Of these after-care is probably the most unintuitive. You really need to understand the trajectory of the lives of disadvantaged children to know that they need personal and logistical support well into early adulthood. We take this for granted with our families, but because it isn’t a familiar solution most interventions don’t cater for this. At Make A Difference we are looking at support systems all the way up to the age of 28. When it comes to enabling institutions, there are five key ones that impact children in shelters. The shelters themselves, school, family, state and society. As an organisation we are faced with a choice. Either we try and do it all ourselves, or we specialise in one or more of the pieces, while partnering or outsourcing to others who can fill in the gaps. Conventional wisdom suggests that focusing is more practical approach, but however we do it, we need to ensure that one way or another the children we work with receive the full complement of interventions they need to break poverty and abandonment cycles. As we understand the problem better we will also understand how to prioritise and focus better, but at the very least we see this as a long term challenge, with a goal of making a lasting difference on a collective macro scale over the next 25 years. It will take a while, but we believe that with the right foundations and a sensible time-frame, transforming adult outcomes for the millions of children in shelters across India is actually an achievable mission. Which brings us back around to the question of whether or not individuals like you or me can fundamentally impact or eradicate the biggest and most pervasive challenges of our times. The truth is if someone had told me when I first started out as a volunteer working with inner city teenagers while at university, that some day it might be possible for me personally to think about eradicating the inequalities faced by the millions of children currently in shelters in India, I would probably have thought they were crazy. But after nearly two decades of working with impact projects all over the world I've started to understand the patterns in the social problems we face, and it all seems eminently more achievable than I imagined back then. All you need is to put in the effort to really understand the issue, and then be prepared for the real time-frames needed to make change on a systemic level. If we put in the effort and time to build and deliver true 'problem based solutions', I firmly believe that we can eliminate many of these challenges in our own lifetimes. 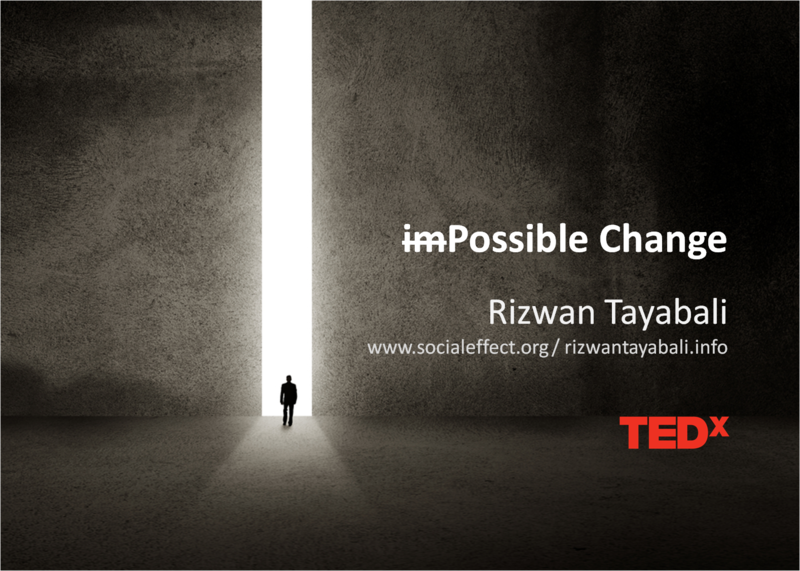 I hope this talk has made you rethink your ability to make a difference to that one big issue that pains you. It won't be easy, but certainly it isn't impossible!